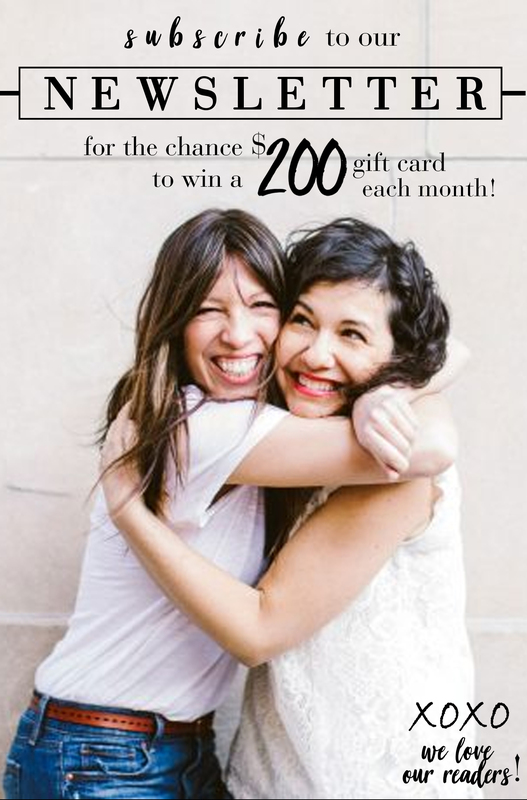 We know Banana Republic’s workwear pieces are always solid choices, but our biggest surprise? The HOLIDAY collection. Understated and cool, yet totally wearable thanks to cozy fabrics, on-point tailoring and updated colors. Here we’ve each picked our top three favorite pieces. 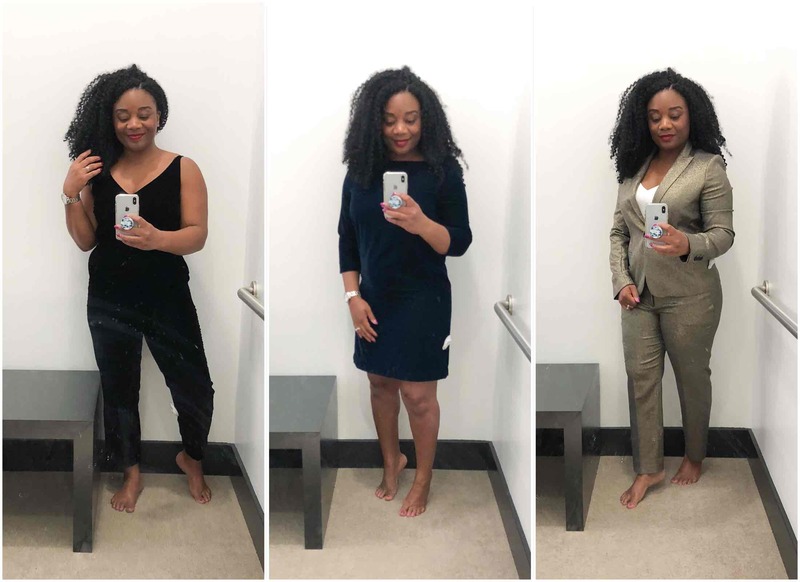 A soft-and-stretchy blazer that rivals my infamous James Perse sweatshirt blazer (SERIOUSLY), and two dresses that I will be wearing the heck out of. I’d say this shopping trip was a raging success. ONE: Banana Republic Navy Velvet Dress – 0 Petite (which is why it’s so short) – I love the sleeves and the color which is (admittedly) hard to see here. But the dress is a definite navy, and looks amazing with black. 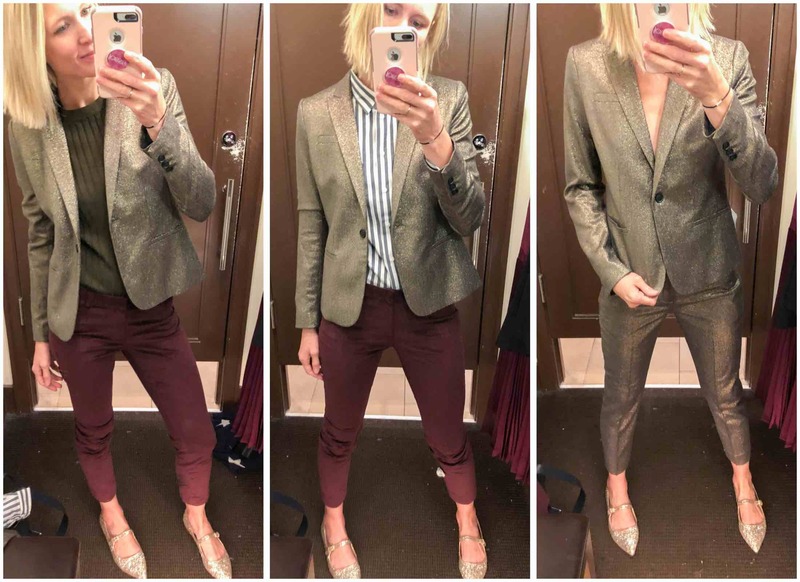 TWO: Banana Republic Ponte Blazer – 0 Petite – I’ve been talking this one up for a while, and it sounds like a bunch of you agree: this one is shockingly good. 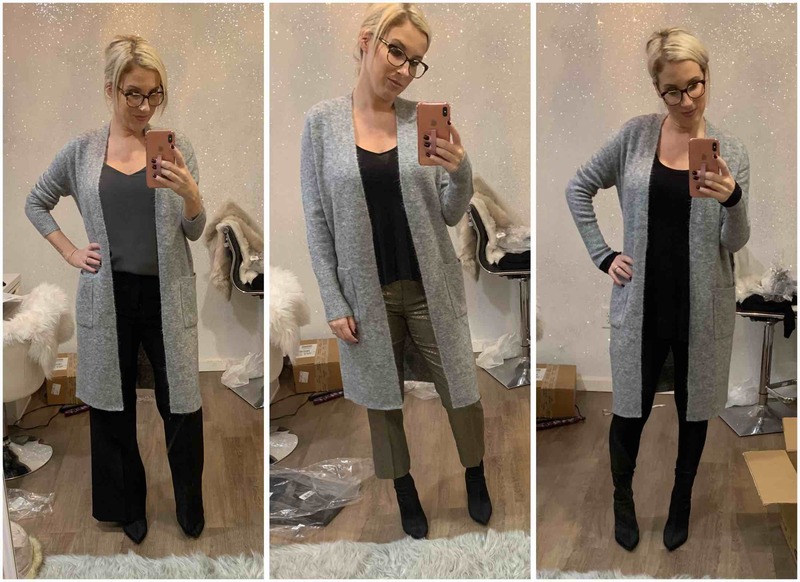 It’s soft, stretchy, and might be as comfortable to wear as a cardigan. Love the sleek detail on the lapel. 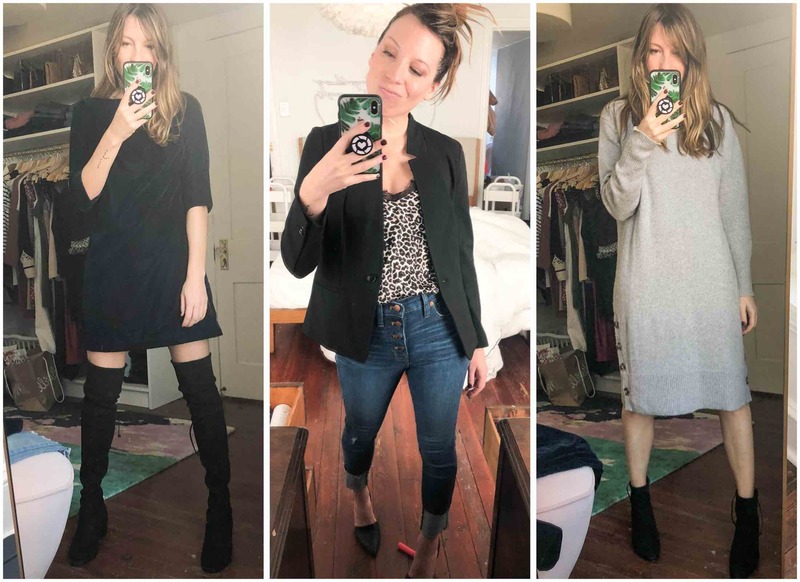 THREE: Banana Republic Sweater Dress – XS – This dress is too big on me. I have both the XXS and the XS-Petite on order, so we’ll see. I do like the roomy fit, though, and slightly longer length — I think it looks especially good with sock booties. If I can get a slightly smaller fit, this will likely be my Thanksgiving dress. Available in regular, petite and tall sizes. You guys. I’m in a dress…that I love! 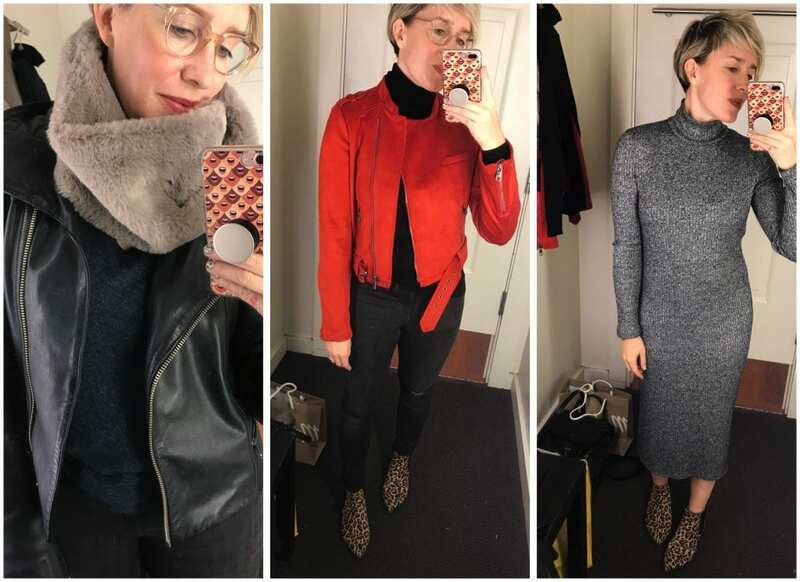 I also found this amazingly gorgeous cowl that even makes a tee and jacket more glam and this killer red moto jacket that is going fast, but also comes in a gorgeous navy. ONE: Twisted Faux Fur Snood – Insanely soft and lux. This would make a lovely gift or a great piece to warm and glam-up any basic outfit for this season. TWO: Vegan Stretch Suede Moto Jacket – Wearing regular size Small. This was so so comfy for a fitted jacket! So cool. THREE: Luxspun Ribbed Turtleneck Dress – So comfy and surprisingly flattering, even with flat boots. Love it layered with my leather jacket, too. Wearing size Small. 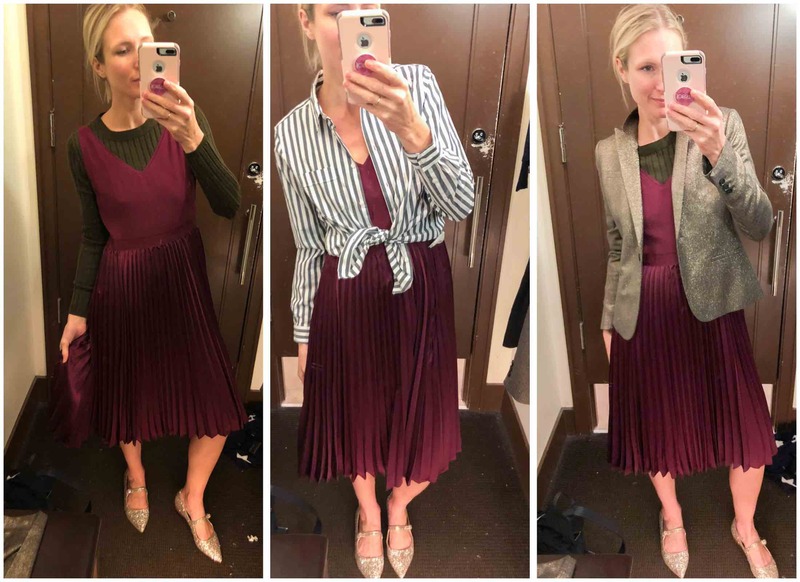 I found a star print pullover sweater, burgundy pleated dress & killer metallic gold blazer – three things I could see styled a few different ways. YASSSS, Holiday Queen. I wanted it all. BTW: I also found these glitter flats on Amazon and styled them with every single outfit I put together that day. 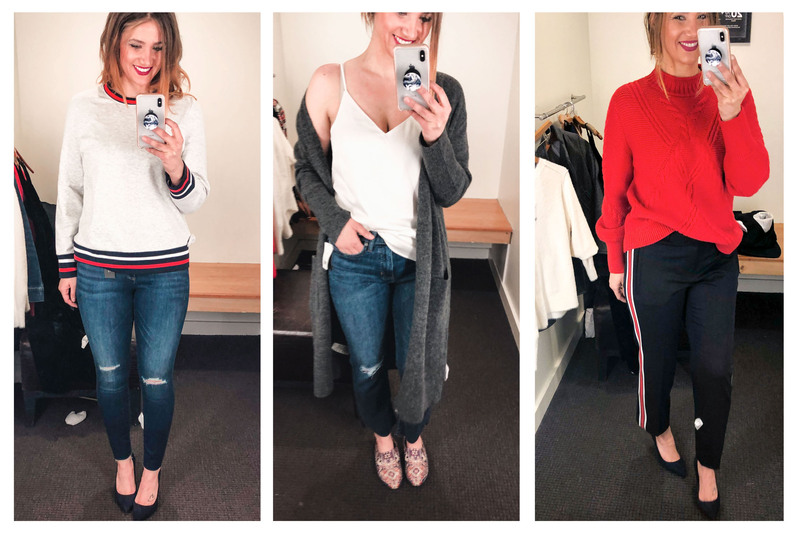 You can see them in my J.Crew (coming soon) & Anthro #dressingroomselfies. If you can’t find your size, check out this very similar pair. 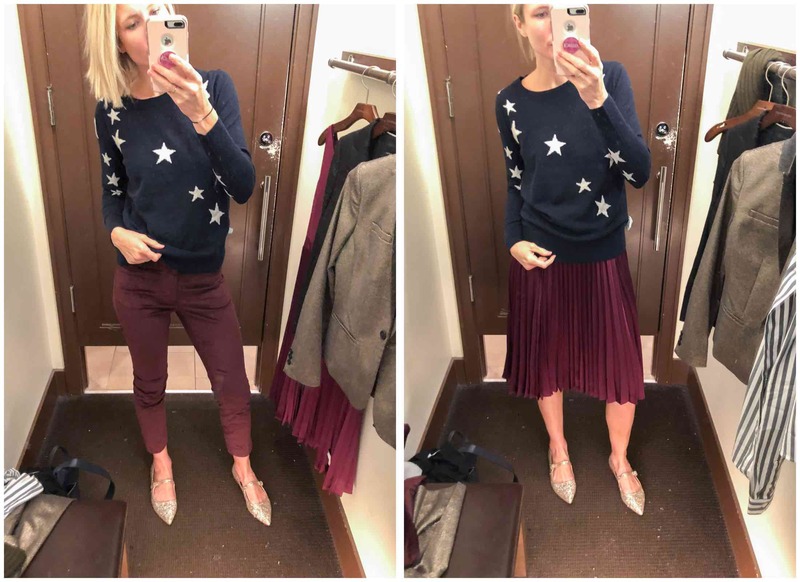 I scored the best skirt at Banana Republic a few holidays ago, so I was excited to see what they have to add sparkle to my holidays this year. 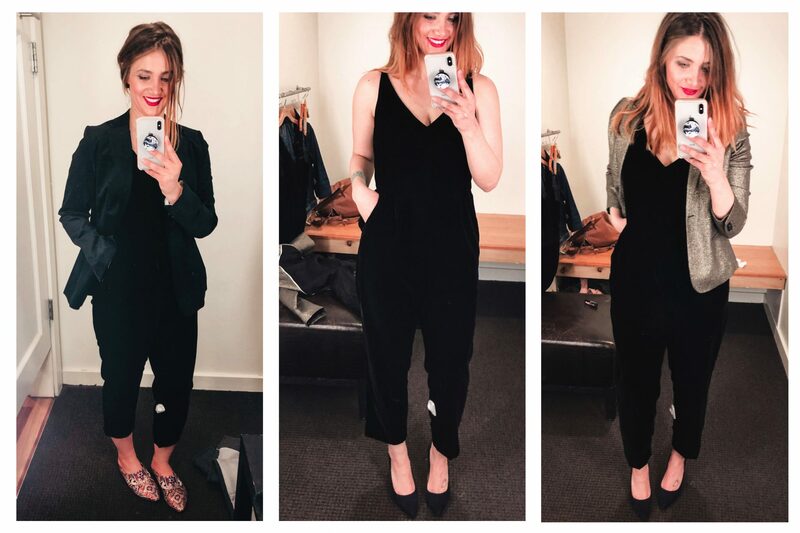 All the velvet seemed like a no-brainer; it’s my must-have this year. The velvet jumpsuit was very comfortable and I’m thinking a metallic belt would accentuate my waist even more. I should’ve styled it with the metallic blazer, but alas, this was a family trip the mall, so I was a bit rushed! Anyway, I moved to the velvet shift dress next. It would like great with a sparkly statement necklace. Finally, the metallic suit was just fab. I love that I’ll be able to style as separates to dress up jeans or a button-down. Versatility is so important, especially if you have more than one holiday event on the calendar. Speaking of which, I found a great pair of faux-leather leggings that aren’t super tight…I kinda love them. 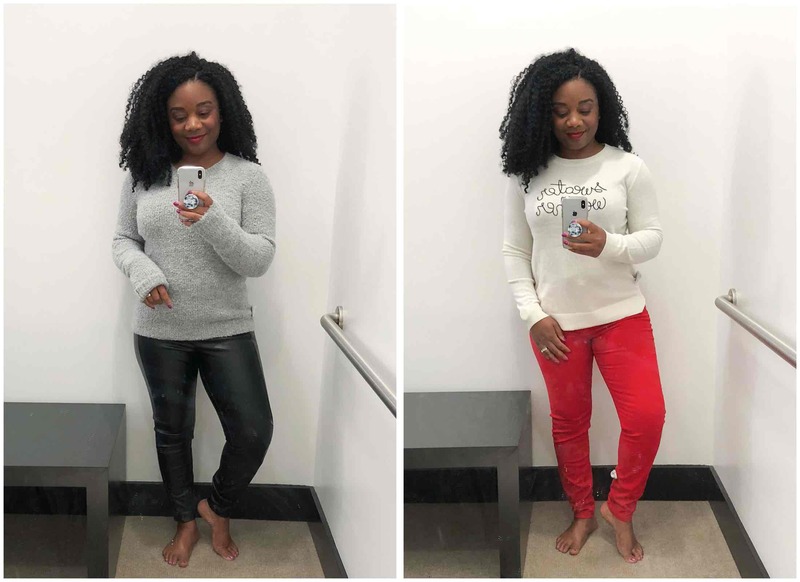 I styled them with a super-soft boucle sweater for the perfect hard-soft mix. They’d also look great with the graphic sweater. “Sweater weather,” indeed! 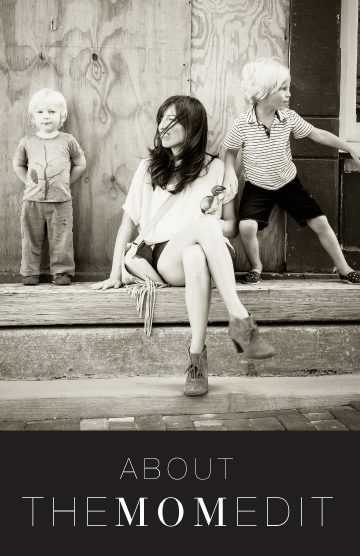 Banana Republic is one of my favorite places to shop during the Winter Season. 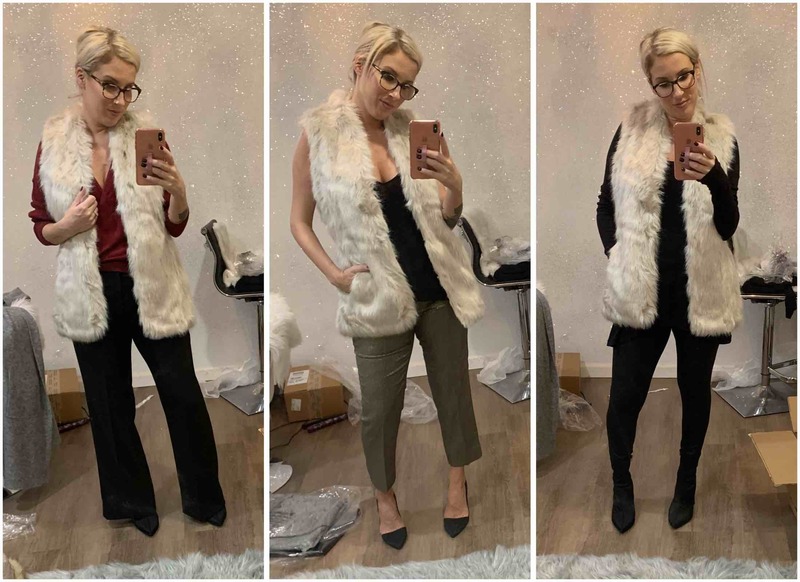 Not only is their knitwear my favorite, but they also know how to CRUSH Holiday Season Wear with their modern take on timeless silhouettes and classic pieces — and I can’t get enough of all their gorgeous velvet pieces like their jumpsuit and blazer. Anyone else have a favorite we missed? Spill! YASSSSSS. I loved seeing one item on many bodies!!! The gold suit was lovely to see on various body types. Great post. Laura, the dress looks great. Love well-fitting pieces. Definitely a keeper. Cam, the suit is perfection. Crisp, cropped, super modern.